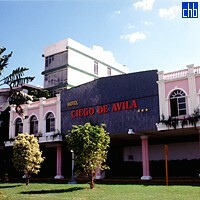 The fairly new Ciego de Avila Hotel offers a most adequate accommodation to hunters and fishermen, and provides a comprehensive service package including preserve transfer, tour guides, shotgun rental, cartridges and jeeps. Also it’s an excellent starting point from which to set out for the cays and the neighboring city of Moron. The rooms have all the amenities required for a pleasant stay. 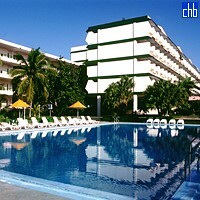 There’s a big pool and lots of entertainment for you to get the best of our hot summer. In the evening, after a gratifying dinner at "La Trocha" restaurant, you’ll dance to lively music in a disco regardless of your age and nationality. 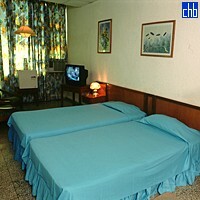 143 air-conditioned rooms with phone, radio, color tv and private bath. Trunk dialing, restaurant (international cuisine), cafeteria, bar, pool, disco, medical service, store, beauty parlor, car park, garden, foreign exchange, post office and central safe.